Apple is about to launch its next-generation iOS in just a few days. Researching developer betas, we discovered that iOS 11 implements a number of new security measures. The purpose of these measures is better protecting the privacy of Apple customers and once again increasing security of device data. While some measures (such as the new S.O.S. sequence) are widely advertised, some other security improvements went unnoticed by the public. Let us have a look at the changes and any forensic implications they have. For the mobile forensic specialist, one of the most compelling changes in iOS 11 is the new way to establish trust relationship between the iOS device and the computer. In previous versions of the system (which includes iOS 8.x through iOS 10.x), establishing trusted relationship only required confirming the “Trust this computer?” prompt on the device screen. Notably, one still had to unlock the device in order to access the prompt; however, fingerprint unlock would work perfectly for this purpose. iOS 11 modifies this behaviour by requiring an additional second step after the initial “Trust this computer?” prompt has been confirmed. 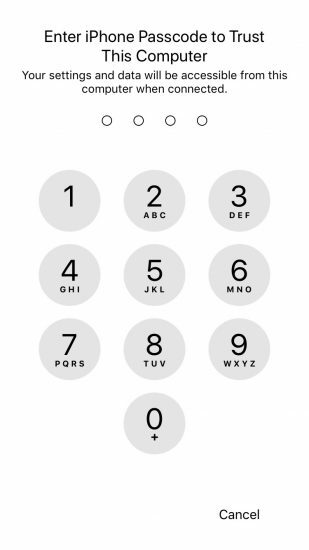 During the second step, the device will ask to enter the passcode in order to complete pairing. This in turn requires forensic experts to know the passcode; Touch ID alone can no longer be used to unlock the device and perform logical acquisition. Starting with version 7.0, Elcomsoft Phone Breaker has the ability to access, decrypt and display passwords stored in the user’s iCloud Keychain. The requirements and steps differ across Apple accounts, and depend on factors such as whether or not the user has Two-Factor Authentication, and if not, whether or not the user configured an iCloud Security Code. Let’s review the steps one needs to take in order to successfully acquire iCloud Keychain. Your ability to extract iCloud Keychain depends on whether or not the keychain in question is stored in the cloud. Apple provides several different implementations of iCloud Keychain. In certain cases, a copy of the keychain is stored in iCloud, while in some other cases it’s stored exclusively on user’s devices, while iCloud Keychain is used as a transport for secure synchronization of said passwords. Who needs access to iCloud Keychain, and why? The newly released Elcomsoft Phone Breaker 7.0 adds a single major feature that allows experts extracting, decrypting and viewing information stored in Apple’s protected storage. There are so many ifs and buts such as needing the user’s Apple ID and password, accessing their i-device or knowing a secret security code that one may legitimately wonder: what is it all about? Let’s find out about iCloud Keychain, why it’s so difficult to crack, and why it can be important for the expert. iCloud Keychain is Apple’s best protected vault. Since iCloud Keychain keeps the user’s most sensitive information, it’s protected in every way possible. By breaking in to the user’s iCloud Keychain, an intruder could immediately take control over the user’s online and social network accounts, profiles and identities, access their chats and conversations, and even obtain copies of personal identity numbers and credit card data. All that information is securely safeguarded. In early July, 2017, Apple has once again revised security measures safeguarding iCloud backups. This time around, the company has altered the lifespan of iCloud authentication tokens, making them just as short-lived as they used to be immediately after celebgate attacks. How this affects your ability to access iCloud data, which rules apply to iCloud tokens, for how long you can still use the tokens and how this affected regular users will be the topic of this article. There are three major mobile operating systems, and three major cloud services. Most Android users are deep into the Google’s ecosystem. iCloud is an essential part of iOS, while cloud services provided by Microsoft under the OneDrive umbrella are used not only by the few Windows Phone and Windows 10 Mobile customers but by users of other mobile and desktop platforms. In this article, we’ll try to figure out what types of data are available for extraction and forensic analysis in the three major cloud platforms: Apple iCloud, Google Account and Microsoft Account. For the purpose of this article, we will use ElcomSoft-developed cloud extraction tools. As we already know, Apple syncs many types of data across devices that share the same Apple ID. Calls logs, contacts, Safari tabs and browsing history, favorites and notes can be synced. The syncing mechanism supposedly synchronizes newly created, edited and deleted items. These synchronizations work near instantly with little or no delay. Apple has a great note taking app that comes pre-installed on phones, tablets and computers. The Notes app offers the ability to take notes and sync them with the cloud to other devices using the same Apple ID. We discovered that Apple apparently retains in the cloud copies of the users’ notes that were deleted by the user. 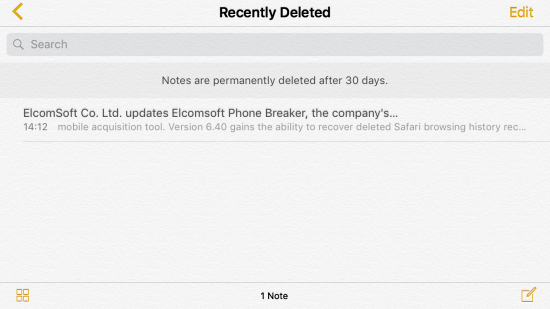 Granted, deleted notes can be accessed on iCloud.com for some 30 days through the “Recently Deleted” folder; this is not it. We discovered that deleted notes are actually left in the cloud way past the 30-day period, even if they no longer appear in the “Recently Deleted” folder. We’ve got a few forensic tools for getting data off the cloud, with Apple iCloud and Google Account being the biggest two. Every once in a while, the cloud owners (Google and Apple) make changes to their protocols or authentication mechanisms, or employ additional security measures to prevent third-party access to user accounts. Every time this happens, we try to push a hotfix as soon as possible, sometimes in just a day or two. In this article, we’ll try to address our customers’ major concerns, give detailed explanations on what’s going on with cloud access, and provide our predictions on what could happen in the future. Update 19/05/2017: what we predicted has just happened. Apple has implemented additional checks just two days ago. This time, the extra checks do not occur during the authentication stage. Instead, the company started blocking pull requests for backup data originating from what appears to Apple as a desktop device (as opposed to being an actual iPhone or iPad). Once again we had to rush a hotfix to our customers, releasing an update just today. Whether or not our solution stands the test of time is hard to tell at this time. It seems this time it’s no longer a game but a war. This whole Apple blocking third-party clients issue creates numerous problems to our customers who are either legitimate Apple users or law enforcement officials who must have access to critical evidence now as opposed to maybe getting it from Apple in one or two weeks. This time it’s not about security or privacy of Apple customers. After all, accounts protected with two-factor authentication are and have been safe. We’ve had similar experience with Adobe several years ago, and surprisingly, it turned out Adobe had reasons beyond privacy or security of its customers. Cloud acquisition has been available for several years. iPhones and iPads running recent versions of iOS can store snapshots of their data in the cloud. Cloud backups are created automatically on a daily basis provided that the device is charging while connected to a known Wi-Fi network. While iCloud backups are great for investigations, there is one thing that might be missing, and that’s up-to-date information about user activities that occurred after the moment the backup was created. In this article, we’ll discuss an alternative cloud acquisition option available for iOS devices and compare it to the more traditional acquisition of iCloud backups. iCloud sync is everywhere. Your contacts and calendars, system backups and photos can be stored in the cloud on Apple servers. This time, we discovered that yet another piece of data is stored in the cloud for no apparent reason. Using an iPhone and have an active iCloud account? Your calls will sync with iCloud whether you want it or not. In fact, most users we’ve heard from don’t want this “feature”, yet Apple has no official way to turn off this behavior other than telling people “not using the same Apple ID on different devices”. What’s up with that? Let’s try to find out. We discovered a major security flaw in the iOS 10 backup protection mechanism. This security flaw allowed us developing a new attack that is able to bypass certain security checks when enumerating passwords protecting local (iTunes) backups made by iOS 10 devices. The impact of this security weakness is severe. An early CPU-only implementation of this attack (available in Elcomsoft Phone Breaker 6.10) gives a 40-times performance boost compared to a fully optimized GPU-assisted attack on iOS 9 backups.